Hope your weekend's going great. Is it cold where you are? One of my favourite outfits that I see female celebs in is the dress-with-booties look. Kate Moss, Kate Bosworth and Sienna Miller always look great when I see them wear this 90's getup. The good thing with this outfit is that you can pretty much wear anything over it -cardigan, leather jacket, blazer...anything! Are you a fan of the dress-with-booties look? 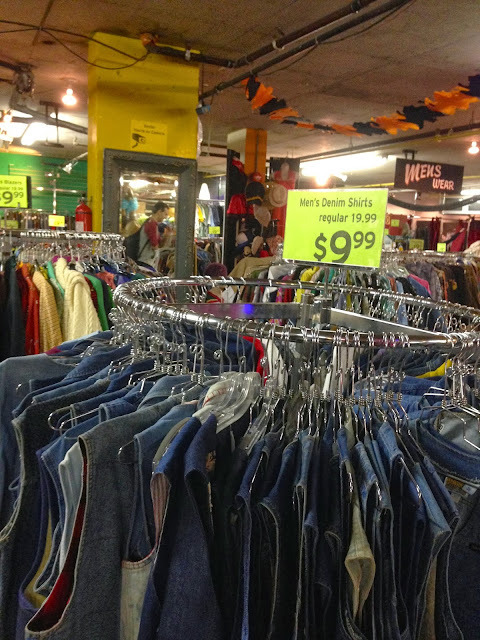 I had the chance to go to Black Market, which is a well-established vintage store here in Toronto. I remember coming here when I was in university, and it's nice to see shops like this still around. I am currently using this, and I highly recommend this bag. It's very well-made and balanced so it's comfortable to carry around. It's also relatively cheap, and waterproof. I now understand the hype. Any new items, gals and guys? I wore this dress for our family Thanksgiving lunch. It's one of those purchases in which I felt like the dress was great the first time I tried it on, but now, not so sure. I'm hoping it'll grow on me. Have you ever had a purchase whereby you're not too sure if you like it or not? Are you familiar with the online game Minecraft? My boys love playing them! I will be honest...I don't understand the whole thing, but since my kids like it, I thought it was appropriate to wear this shirt. To my two boys, this one's for you! Anyhoo, Happy Thanksgiving to my fellow Canadians. If you're a Wes Anderson fan, this book is a must-have. No words to describe how much I love the movie The Royal Tenenbaums, so getting this was a no-brainer. Pics and essays and all kinds of info about his films. Brilliant intro by the author Michael Chabon. I mentioned this perfume on this post. The scent is just amazing. Will purchase the big bottle next time. Do you wear summer shoes during fall/winter?